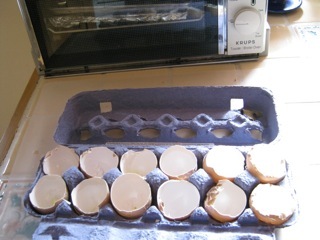 ….. one way to put empty egg cartons and shells to good use. Carefully crack each egg, take both halves of the shell and rinse under faucet; then put halve together and return to the plastic egg carton. When you have a carton full of empty shells, fill each shell with planting soil and plant a seed. Water, cover with plastic wrap and set in a sunny window. 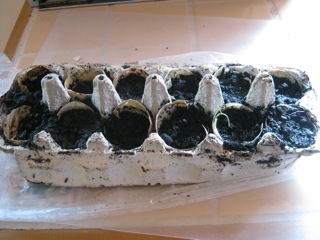 After they sprout, transfer to larger pot. The shells contain calcium for your plant, so can be crushed and left in the soil. MARCH GARDENING TIPS……..a good time to study your seed catalogs and decide which varieties of open pollenated to plant: Heirloom Solutions, Seed Savers Exchange, Abundant Life Seeds, all have websites you can check out. Some other companies like Territorial have some non hybrid seeds that are not genetically modified. Be careful. Check out their system of marking. You want to buy be sure to buy non hybrid heirloom type seeds so you can get out those seed catalogs and start making plans for this year’s garden. If you plant non hybrid seeds, you will be able to save the seed progeny from your plants and participate in the local seed exchange being planned for this fall. BBSRCwill be holding some sort of a social occasion to exchange seeds, where your cost of admission will be non hybrid seeds . We welcome helpful gardening tips from you……….